Thanks for this wonderful 3 country tour. Actualy, this was not just a trip, this was an incredible journey and a chance to know more about amazing and differents cultures, people and countries. India is a once-in-a-lifetime experience that you only feel in that Place. Is impossible to describe with words incredible places like the Taj Mahal or the "Pink City" in Jaipur. China has so many places to visit; the cities that you choose for us was a highlight of that culture: the lovely Pandas in Chengdu, the historic Terracota Warrios of Xi'an, and the endless neauty of Beijing. Nepal was great - Nice people, beutiful landscapes and amazing country waiting to be discover. We felt Nepal like our second home - paceful place, friendly people and of course your special support and friendship. I want to thank you very much for the Incredible trip that you makes for my sister and my friends to Delhi, Taj Mahal, Nepal and Tibet. You are very professional, and the most important is your attitude very positive, and all of your team, everybody was always smiled in a good mood and happy every day, I am sure that you are the best travel agent in Nepal, cause you always have a solution for our doubts and everything. We will visit again your country, it is beautiful, and unforgettable! We hope to go back very soon, and have another great experience with you! I already starting passing your names to our friends and relatives here in Maxico. Namaste! 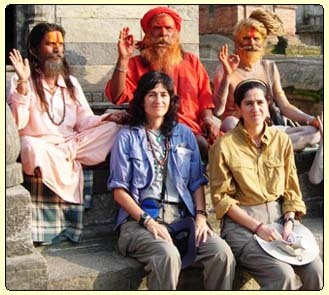 Rocio Dominguez, Elizabeth, Guadalupe and Romy Sala from Maxico, India - Nepal - Tibet tour - booked via website in Oct 2007. To: "Earthbound Expeditions - Nepal"
Hi Rajan, Yes, we made it back safely to home and are both back to work, We certainly had a wonderful time and appreciate all of your help in making our dream vacation (India - Nepal - Tibet - China tour ) become a reality. When we arrived home, the border patrol was very surprised that we even made it into Tibet. Like you said, several people were denied entry and they were very surprised that we were allowed in. I told them that we had a great travel coordinator who made it happen! that is you, Thanks again, Rajan. Please keep in touch! The tour Nepal and Tibet that you have organized has been very beautiful, we have been very happy of the services from you offered. We are making here you a lot of publicity in Italy and we hope that some friend of ours goes to Nepal. We still thank you so much for your availability and seriousness and to have contributed to make this very beautiful trip. My experiences during the Nepal, India, Tibet by EarthBound Expeditions have no equal to any other tour I have taken. Simply put, wondrous. Beginning with your personal attention to the booking details and questions and extended up to your guiding in Kathmandu and relating your personal insights. At all times you made me feel welcome and everything possible was being done to make the trip enjoyable. You succeeded most immeasurably. The same words can be said of my trekking guide, Shreeram. The days we were together provided some deep insights into Nepalese culture and everyday life outside of the city. Between the two of you, you give the visitor far more than can be found in a tourist handbook. This is meeting the real Nepalese people and finding a warmth that stays in the heart and travels home. This alone was worth the price of the journey. This does not even recount the sights brought to the eyes of the scenery, the monasteries or the palaces. The pictures do not do justice to these sights. Breathtaking does not describe them. Some, like the Taj Mahal, learning the story surrounding it was even more moving than merely seeing the beautiful buildings, all of them. Part of the adventure is stepping out of my culture and experiencing the unexpected. That is part of this journey and it was enjoyed. I have proudly recommended you to everyone to whom I have related my vacation journey. In all my travels, your service and attention to your client is far superior to all. You & your company do an exceedingly good job. Tashi delek Rajan, excuse me for answering quite late, my internet didn't worked and I had my mind quite occupied since I' m back home. My wayback was fine, happy to see back family and friends. I had a wonderful trip, thank you for all, it was a great experience to travel India - Nepal Tibet at once! I have advise your company for the next edition in one of the french bookguide, it will problably in the 2008 edition. until I will see back, I' ve got in my mind full of pictures and feelings... good luck for the end of the year. namaste! This 3-country tour ( India, Nepal, Tibet) from 19th Aug. to 6th of Sept. 2005 was an exceptional experience for us. We appreciated the hard work you put in getting us our travel permit to Tibet (while group travel was not possible at time of our travel). Our Tibet trip was not what we originally expected, but the experience let us with a lasting experience, that we could only have achieved visiting Tibet at their 40th Anniversary of the Chinese achievement ceremony. Without you and with out your connections this trip would not have been possible, we will never forget it! Thank you ! Thanks to Earthbound Expeditions for organizing our adventure in India & Nepal. Within the very short-time we managed to see most of the things that we planned to see. As we have been wondered on what to expect at each places managed to visit by the agency, we have more prepared to face the reality, and everything seems to be like a great adventure and we embrace them all. India has its one uniqueness and so has Nepal. Our stay in Nepal is more memorable as we have the pleasure of the company of Mr. Rajan who is very knowledgeable of the places and very entertaining. Every thing is excellent. I booked your India - Nepal trip through internet and was not sure how I will get the service but your service is excellent and professional, more then we expected. This tour gives me excellent experience of both Nepal and India one of the best tour ever!, thank you very much Rajan, you are very honest & caring person, I hope we will have more tours with you in the future to Tibet and Lumbini. We highly recommend you to all of my friends. Keep in touch. My wife and I enjoyed very much this vacation tour guided by you. from home before starting the trip we did not expect this trip will be so pleasant but day by the more we experience this trip the more we are pleased by the way realize how you help us to enjoy the sightseeing, you care for your customers very much. We are so enjoyed and relaxed that we will tell our friends about your agency if any one wants to see Nepal, India, Tibet or just a good vacation after our days of hardworking in our homeland = USA. Once more time thank you Rajan! I understand that you and friends are considering a trip to Mount Kailash. I wish you the best of travels and assure you that the memories of this sacred place will stay with you always. In year 2000, an old friend and I had the pleasure of having Rajan Simkhada and Earthbound Expeditions expedite our sojourn from Simikot in western Nepal to Kailash and back. Our trip entailed several things out of the ordinary which only happened through the help of Rajan. Our small group of 2 was below the minimum allowed by the Chinese government and required special permits to be issued. We, as geologists and pilgrims wanted to walk the whole route and depart from the road to see the western shore or Raksas Tal Lake. Typically, the Chinese have people ride in a jeep from the border to the mountain and back. After long haggling, we were assigned a jeep but allowed to walk the whole way, a compromise that Rajan obtained for us. At the time of our trip, the Limi Valley along the border in Nepal was off limits to travelers but Rajan negotiated permission from our Nepalese liaison officer to traverse the valley. Besides the thousand and one small things that Rajan handled, often without our being aware, he very persuasively obtained seats for us on a plane out of Simikot for our return to Kathmandu and saved us a 3-4 day wait in Simikot (he stayed behind and brought our luggage to Kathmandu several days later on the next flight out). Rajan is a very adept young man. Having transitioned from a remote village to Kathmandu, Rajan is well known throughout Nepal for his work in television and is the driving force behind Earthbound Expeditions. As a devote religious man, he was the perfect travel companion and friend to share in this sacred space. I encourage you to make the trip to Kailash and I wish you the best of travels. If you decide to use Rajan’s and Earthbound’s services you will not be disappointed. I would be happy to answer any questions you might have.